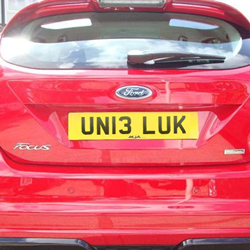 carbuzz.co.uk asked over 2,000 car buyers whether the upcoming 13 number plate would put them off buying a new car. Cars registered between 1st March and 31st August will carry the 13 number plate. There was speculation over the DVLA potentially allowing people to skip out the ‘unlucky’ 13 plate altogether and revert to the 62 plate, carbuzz.co.uk wanted to find out how rife this superstition actually was amongst uk car buyers and whether they would really be put off buying a new car because of it. The results point to new car sales suffering greatly as a result of the new 13 plate. 27.1% in total said they were put off buying a car with the 13 plate. 10% of respondents said they wouldn’t buy because they were superstitious, the fear of the number 13 is known as Triskaidekaphobia. 17% of respondents wouldn’t buy a new car with a 13 plate as they think their car would be worth less later, showing that non-superstitious people could be anxious about a drop in resale value, or the difficulty in selling their new car on later. 73% weren’t bothered, but 27% less car sales in the first half of 2013 could be pretty devastating for the car industry as a whole. James Hind, founder of carbuzz.co.uk, said “The 13 plate applies to cars registered from 1st March to the 31st August 2013. In 2012 this period accounted for 52% of total registrations. These findings show that the car industry should expect to see a large decline in new car sales for 2013, many consumers will either delay buying a new car or choose a used car instead”. Is there something seriously wrong with the UK new car market?Can Winter Tyres Give You 4x4 Grip?